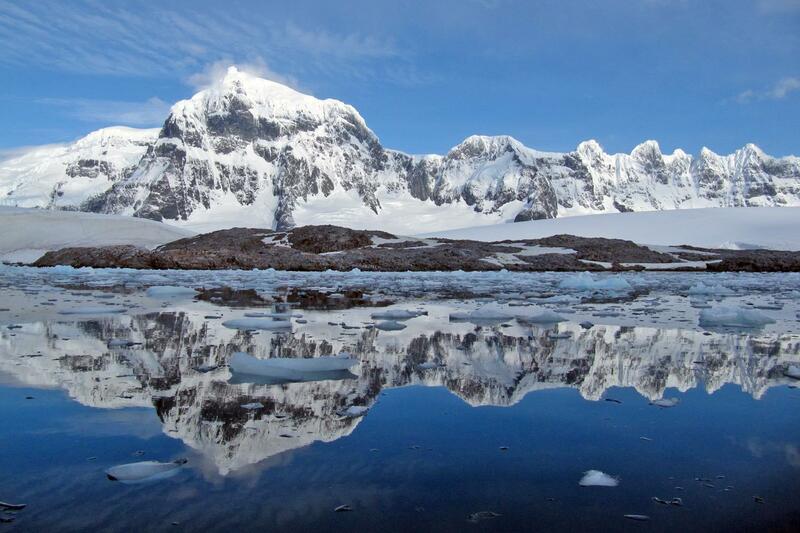 A truly comprehensive Antarctic expedition with maximum landing opportunities! 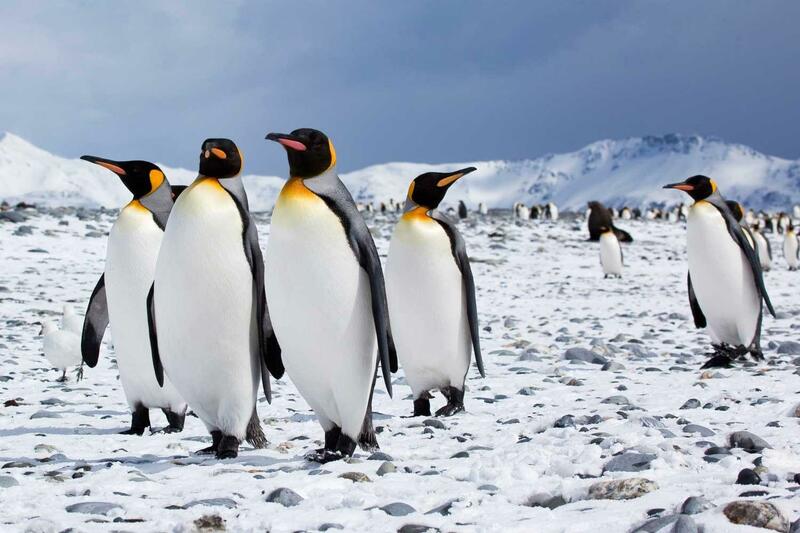 See many different penguin species during this comprehensive Antarctic expedition. 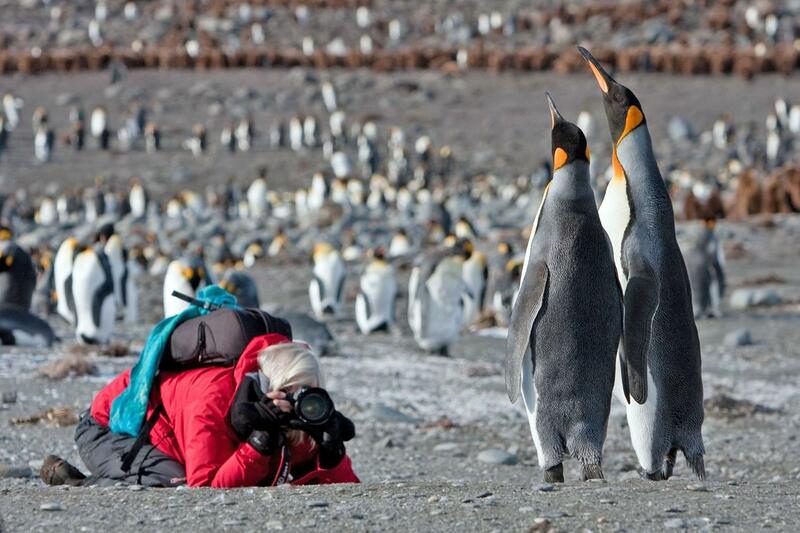 Combine the major Antarctic highlights in one voyage. 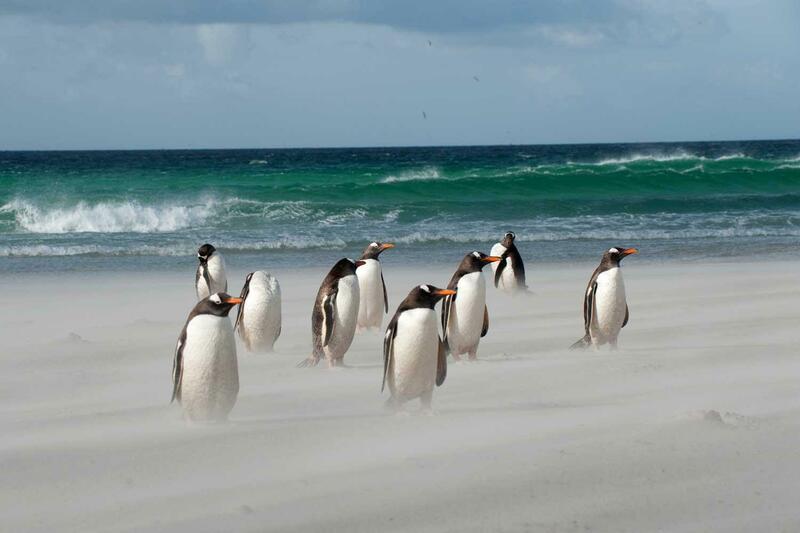 Visit the wildlife-rich Falkland islands (Carcass and Saunders) with their populations of rockhopper penguins and black-browed albatross along with majestic South Georgia, famed for its elephant seals, king penguins and breeding grounds of the wandering albatross. The expedition will also aim for a landing on the continent of Antarctica as well as extra time to cross the polar circle. Day 1: Ushuaia Your voyage begins where the world drops off. Ushuaia, Argentina, reputed to be the southernmost city on the planet, is located on the far southern tip of South America. Starting in the afternoon, you embark from this small resort town on Tierra del Fuego, nicknamed “The End of the World,” and sail the mountain-fringed Beagle Channel for the remainder of the evening. Day 2: Scotia Sea Several species of albatross follow the vessel into the westerlies, along with storm petrels, shearwaters, and diving petrels. 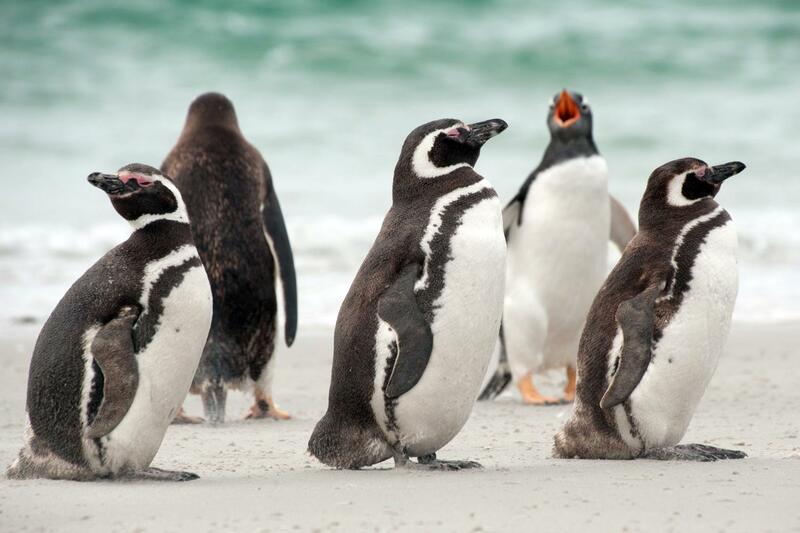 Day 3: Falkland Islands archipelago The Falkland Islands offer an abundance of wildlife that is easily approachable, though caution is always advised. These islands are largely unknown gems, the site of a 1982 war between the UK and Argentina. Not only do various species of bird live here, but chances are great you’ll see both Peale’s dolphins and Commerson’s dolphins in the surrounding waters. During this segment of the voyage, you may visit the following sites: Carcass Island Despite its name, this island is pleasantly rodent-free and hence bounteous with birdlife. Anything from breeding Magellanic penguins and gentoos to numerous waders and passerine birds (including Cobb’s wrens and tussock-birds) live here. Saunders Island On Saunders Island you can see the black-browed albatross and its sometimes-clumsy landings, along with breeding imperial shags and rockhopper penguins. King penguins, Magellanic penguins, and gentoos are also found here. Day 4: Port Stanley, Falklands The capital of the Falklands and center of its culture, Port Stanley has some Victorian-era charm: colorful houses, well-tended gardens, and English-style pubs are all to be found here. You can also see several century-old clipper ships nearby, silent witnesses to the hardships of 19th century sailors. The small but interesting museum is also worth a visit, covering the early days of settlement up to the Falklands War. Approximately 2,100 people live in Port Stanley. Feel free to wander at will, though be aware that admission fees to local attractions are not included in the voyage. Day 5 – 6: Once more to the sea En route to South Georgia, you now cross the Antarctic Convergence. The temperature cools considerably within the space of a few hours, and nutritious water rises to the surface of the sea due to colliding water columns. This phenomenon attracts a multitude of seabirds near the ship, including several species of albatross, shearwaters, petrels, prions, and skuas. Day 7 – 10: South Georgia exploration Today you arrive at the first South Georgia activity site. Please keep in mind that weather conditions in this area can be challenging, largely dictating the program. 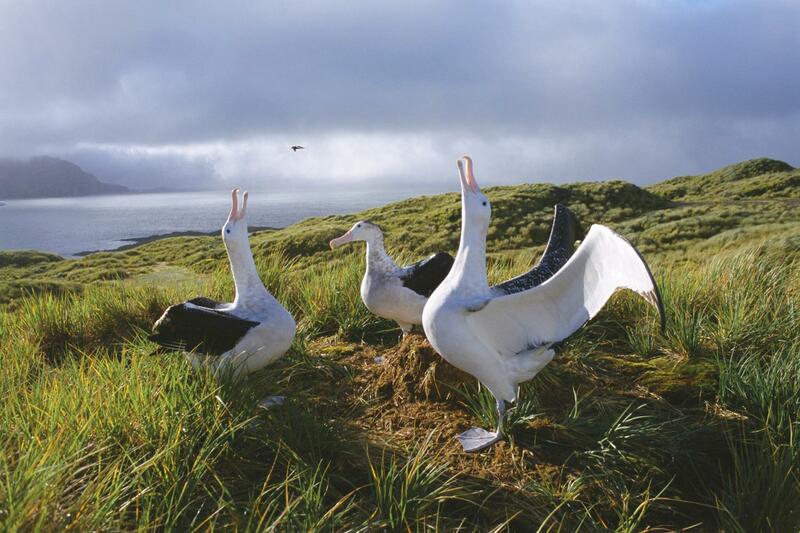 Over the next several days, you have a chance to visit the following sites: Prion Island This location is closed during the early part of the wandering albatross breeding season (November 20 – January 7). 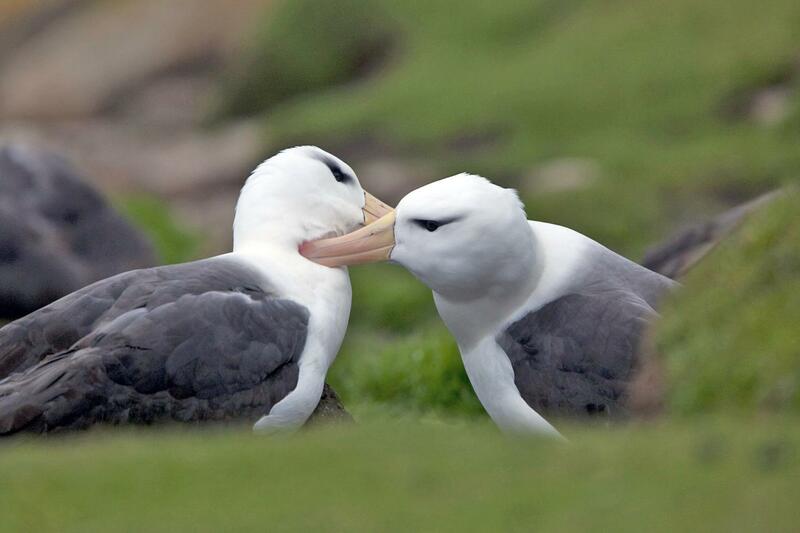 From January on, the breeding adults have found their partners and are sitting on eggs or nursing their chicks. Enjoy witnessing the gentle nature of these animals, which possess the largest wingspan of any birds in the world. Fortuna Bay Near beaches inhabited by various penguins and seals, you have the chance to follow the final leg of Shackleton’s route to the abandoned whaling village of Stromness. This path cuts across the mountain pass beyond Shackleton’s Waterfall, and as the terrain is partly swampy, be prepared to cross a few small streams. Salisbury Plain, St. Andrews Bay, Gold Harbour These sites not only house the three largest king penguin colonies in South Georgia, they’re also three of the world’s largest breeding beaches for southern elephant seals. Only during this time of year do they peak in their breeding cycle. Watch the four-ton bulls keep a constant vigil (and occasionally fight) over territories where dozens of females have just given birth or are about to deliver. You can also see a substantial number of Antarctic fur seals here during the breeding season (December – January). Grytviken In this abandoned whaling station, king penguins walk the streets and elephant seals lie around like they own the place – because they basically do. Here you might be able to see the South Georgia Museum as well as Shackleton’s grave. 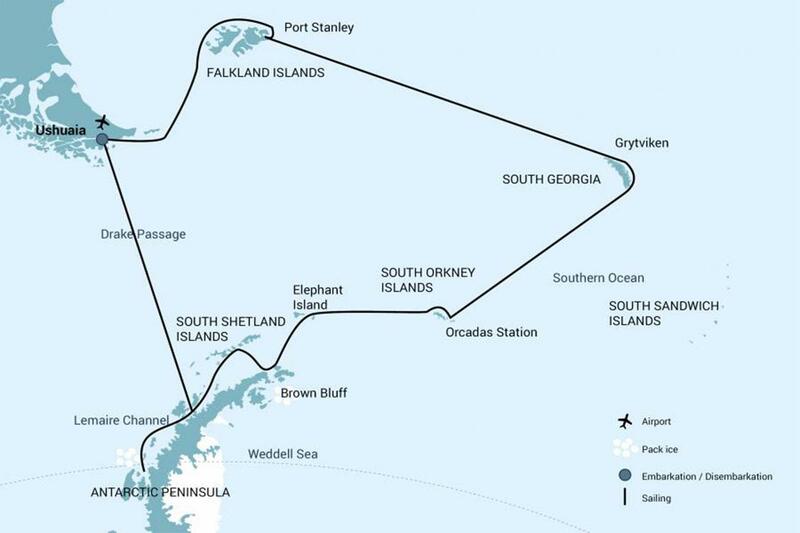 Day 11: Southward bound There may be sea ice on this route, and at the edge of the ice some south polar skuas and snow petrels could join the other seabirds trailing the vessel south. Day 12: South Orkney Islands Depending on the conditions, you might visit Orcadas Base, an Argentine scientific station on Laurie Island in the South Orkney archipelago. The personnel here will happily show you their facility, where you can enjoy expansive views of the surrounding glaciers. If a visit isn’t possible, you may instead land in Signy Island’s Shingle Cove. Day 13: Legendary Elephant Island You‘ve now completed roughly the same route (albeit in the opposite direction) as Sir Ernest Shackleton did using only a small life boat, the James Caird, in spring of 1916. Watching Elephant Island materialize on the horizon after crossing all that water, it’s hard not to marvel at how he and his five-man crew accomplished that feat. The purpose of Shackleton’s crossing was to rescue 22 shipwrecked members of his Imperial Trans-Antarctic Expedition, also known as the Endurance Expedition, who were stranded on Elephant Island. For four and a half months, Shackleton undertook this legendary rescue. Conditions on Elephant Island are severe. The coastline is mostly made up of vertical rock and ice cliffs highly exposed to the elements. If possible you will take the Zodiacs to Point Wild, where the marooned members of Shackleton’s expedition miraculously managed to survive. Day 14: Northeastern Antarctic Peninsula If ice permits, you sail into the Antarctic Sound at the northwestern edge of the Weddell Sea. Here colossal tabular icebergs herald your arrival to the eastern edges of the Antarctic Peninsula. Brown Bluff is a potential location for a landing, where you may get the chance to set foot on the continent. Day 15: South Shetland Islands The volcanic islands of the South Shetlands are windswept and often cloaked in mist, but they do offer subtle pleasures: There’s a wide variety of flora (mosses, lichens, flowering grasses) and no small amount of fauna (gentoo penguins, chinstrap penguins, southern giant petrels). In Deception Island, the ship plunges through Neptune’s Bellows and into the flooded caldera. Here you find hot springs, an abandoned whaling station, and thousands of cape petrels – along with kelp gulls, brown and south polar skuas, and Antarctic terns. A good hike is a possibility in this fascinating and desolate volcanic landscape. Day 16 – 20: Onward into Antarctica Gray stone peaks sketched with snow, towers of broken blue-white ice, and unique polar wildlife below and above welcome you into the otherworldly expanse of Antarctica. You enter the area around Gerlache Strait, venturing into one of the most beautiful settings Antarctica has to offer. Sites you may visit here include: Neko Harbour An epic landscape of mammoth glaciers and endless wind-carved snow, Neko Harbour offers opportunities for a Zodiac cruise and landing that afford the closest views of the surrounding alpine peaks. Paradise Bay You may be able to take a Zodiac cruise in these sprawling, ice-flecked waters, where there’s a good chance you’ll encounter humpback and minke whales. Pléneau & Petermann Islands If the ice allows it, you could sail through the Lemaire Channel in search of Adélie penguins and blue-eyed shags. 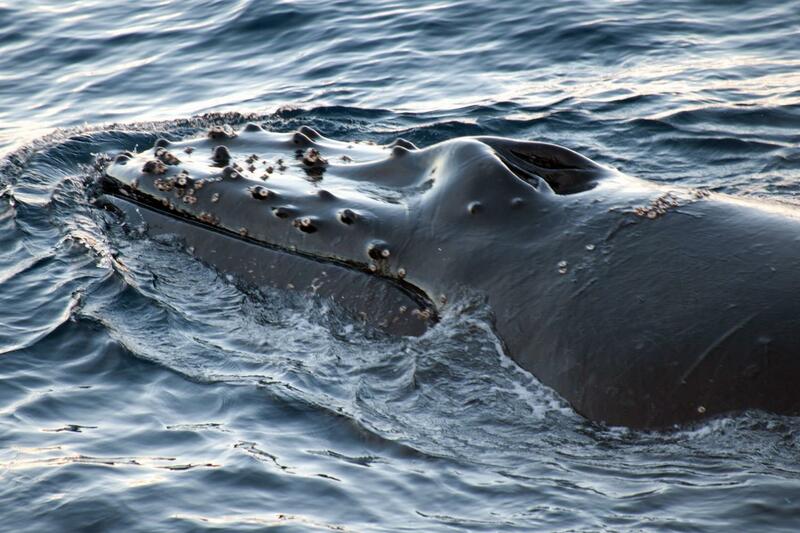 There is also a possibility you’ll encounter humpback and minke whales here, as well as leopard seals. Antarctic Circle The aim is then to cut south, reaching Crystal Sound and the Antarctic Circle. You may make a landing at Detaille Island and visit an abandoned British research station, taking in the limitless landscape. Afterward you venture back into the area around Lemaire Channel and the Gerlache Strait. As with all of our Antarctic trips, conditions on the Drake Passage determine the exact time of departure. 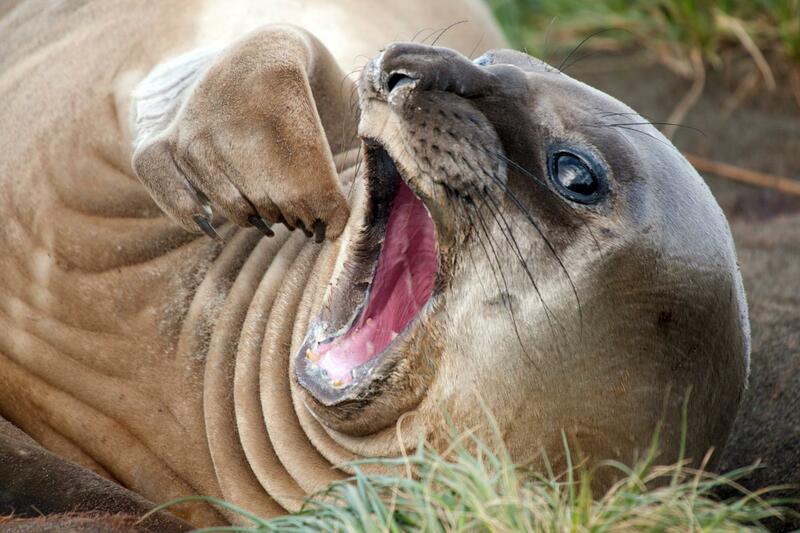 Day 21 – 22: Drake Passage Your return voyage is far from lonely. While crossing the Drake, you’re again greeted by the vast array of seabirds remembered from the passage south. But they seem a little more familiar to you now, and you to them. Day 23: Ushuaia Every adventure, no matter how grand, must eventually come to an end. It’s now time to disembark in Ushuaia, but with memories that will accompany you wherever your next adventure lies. PLEASE NOTE: All itineraries are for guidance only. Programs may vary depending on local ice, weather, and wildlife conditions. The on-board expedition leader will determine the final itinerary. Flexibility is paramount for expedition cruises. Average cruising speed of m/v Hondius is 10.5 knots.